Mr. Grodzki practices in the area of personal injury, disability law, tort law and insurance litigation with a primary focus on motor vehicle accidents (Car and Motorcycle Accidents), insurance claims and slip & fall cases for Plaintiffs. Mr. Grodzki is a partner at the Ottawa personal injury law firm, Quinn, Thiele, Mineault, Grodzki LLP and serves clients throughout the Ottawa and Eastern Ontario areas. He is fluent in French, English, and Polish. He can also converse in German. 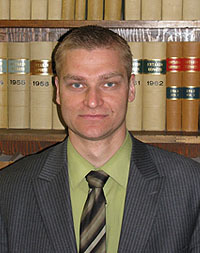 Mikolaj has experience appearing before the Ontario Superior Court of Justice and before various administrative tribunals, including the Social Benefits Tribunal and Criminal Injuries Compensation Boards. Mikolaj Grodzki is known for his patience, diligence and understanding of the complex issues involved in car accident and other personal injury cases. He protects his clients’ rights, ensuring that they receive the fair financial compensation they deserve. Feel free to contact him for your free, no obligation, consultation at (613) 563-1131 OR e-mail: mgrodzki@ottawalawyers.com.